to see and develop visual skills. Undetectedvision problems and eye conditions can cause developmental delays and are best caught early. Even if no eye or vision problems are apparent, the American Optometric Association recommends scheduling your baby’s first eye assessment at 6 months. As your child becomes school-aged, their visual demands will increase as they learn to read and write. Did you know that 80% of learning occurs through sight and 5 to 10% of kids have a visual problem? Of kids that have a learning disability 35 to 40% have a vision deficit! Just like walking and talking, infants need to learnto see and develop visual skills. Undetectedvision problems and eye conditions can cause developmental delays and are best caught early. Whether or not your child has these problems, they will receive a comprehensive eye exam to evaluate their binocular vision as well as their refractive and ocular health. 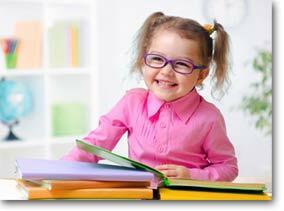 With proper diagnosis and treatment your child can overcome their vision problems and gain confidence. Make sure your child has clear, comfortable vision to help unlock their potential!